A warehouse, right, in Iowa owned by for-profit dog dealer J.A.K. 'S Puppies houses puppies for transport to stores. After Chicago passed its anti-puppy mill law, J.A.K. 'S owners formed the nonprofit Hobo K-9 Rescue. J.A.K. 'S Puppies and Hobo K-9 Rescue use the same storefront in Britt, Iowa, as their business address on veterinary inspection certificates, though a sign on the door identifies it only as the J.A.K. 'S office. Iowa Attorney General Tom Miller filed a lawsuit Monday to shut down an alleged puppy-laundering ring, including dissolving two “pet rescue” non-profits accused of exporting designer dogs from Iowa to pet shops in other states. CHICAGO — An alleged "national puppy laundering ring" that supplied dogs to Chicago pet shops could be shut down following a Chicago Tribune report last year that exposed how the stores were selling pure-bred and designer pets, despite the city's anti-puppy mill ordinance. 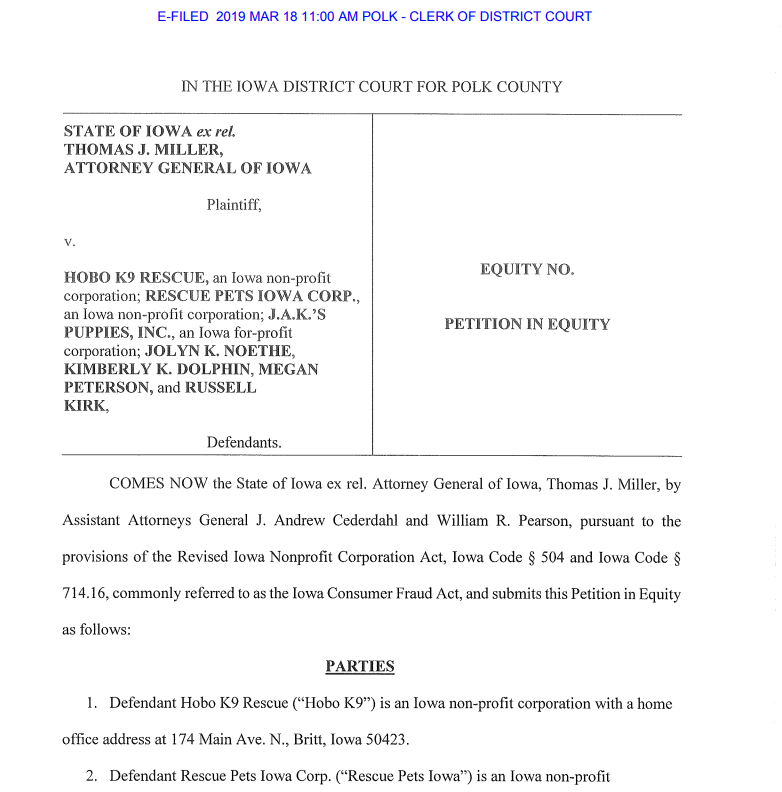 In a civil complaint filed Monday, Iowa Attorney General Tom Miller accused an animal shelter based in Britt, Iowa, of consumer fraud and alleged it's a front for a for-profit canine wholesaler in the same small town. Miller said his office's nine-month investigation found the owners of J.A.K. 'S Puppies started Hobo K-9 Rescue in 2016 as a way to provide pricey pups to businesses in California and Chicago, where laws require pet stores to sell only shelter animals. Miller asked Iowa courts to order Hobo K-9 Rescue to cease operation, saying it abused its authority under the state's nonprofit laws. He is seeking fines against the rescue's owners for alleged consumer fraud violations. The attorney general also requested a temporary injunction prohibiting J.A.K. 'S Puppies from any business or charitable activities involving the transfer of animals and a permanent order barring the business from using deceptive practices. "The defendants are integral actors of a national puppy laundering ring emanating from within Iowa," Miller stated in his complaint, which was filed in Polk County. Neither J.A.K. 'S Puppies co-President Jolyn Noethe nor her spokeswoman could be immediately reached for comment. The Iowa attorney's general's office opened its investigation in June 2018 after the Tribune found that a loophole in Chicago's anti-puppy mill ordinance allowed three city pet stores to sell puppies supplied by rescues that are closely linked to longtime commercial dealers. In an arrangement that is not an express violation of the city ordinance but runs counter to the spirit of the ban, records show these rescues provide city shops each year with hundreds of purebred and designer-mix puppies -- all of which come through kennels and properties owned by for-profit businesses or dealers. J.A.K. 'S and Hobo K-9 were heavily cited in the story, as public records showed there was little distinction between the two north-central Iowa operations. Both entities use the same storefront along Britt's Main Street as their business address on veterinary inspection certificates, though a sign on the door identifies it only as the J.A.K. 'S office. The rescue puppies are fed at the same time, examined by the same veterinarians and often transported on the same day as the commercial ones sold to suburban pet shops, state records show. The vast majority come to the Chicago area at 8 weeks old -- the earliest a puppy can be separated from its mother under Illinois law. J.A.K. 'S exported 805 dogs to Illinois between January 2015 and November 2017, according to certificates of veterinary inspection filed with the Iowa Department of Agriculture and Land Stewardship. The records show 71 percent of the puppies were purebred, while the remaining 29 percent were considered designer mixes. The J.A.K. 'S puppies had a median age of 61 days at the time of their inspections, which typically occurred a few days before transport. Hobo K-9 Rescue, which was formed in September 2016, exported 512 dogs between its inception and December 2017, according to the inspection certificates. About 73 percent of the puppies were pure breeds, while 27 percent were designer mixes. The median age for the Hobo rescue puppies was 61 days at the time of inspection, just like the dogs that J.A.K. 'S sold to suburban pet stores. Hobo sent all 512 puppies labeled as rescues to Pet Luv Pet Center just south of Midway International Airport, records show. The Tribune investigation found none of the exported animals was older than 16 weeks or mutts, an unusual inventory for a rescue organization. The Iowa attorney general's inquiry found similar results, with Hobo K-9 exporting 1,290 puppies between September 2016 and July 2018. All were purebred or designer mixes, like a Goldendoodle puppy the "rescue" sold to Chicago-based Park Pet Shop in October 2018 for $3,599.99, according to the court filing. "No legitimate charitable rescue's associated fees to 'adopt' or 're-home' a dog would ever even approach such an extravagant, for-profit sum as $3,599.99," the filing states. Hobo K-9 Rescue told the attorney general's office it received $714,510 for the 1,290 puppies it exported from Iowa between September 2016 and July 2018, according to court records. During that time, Hobo K-9 wrote several large checks to J.A.K. 'S Puppies to cover procurement fees for the dogs it purported to have rescued, the filing states. Because the two entities have the same officers, "it appears they must claim to 'rescue' puppies from themselves -- or from the for-profit puppy mill industry in which they participate," the filing states. Attempts to reach the owners of the two Chicago pet stores named in the complaint also were not immediately successful Monday. Cari Meyers, founder of Chicago-based The Puppy Mill Project, which pushed for the city ordinance and long has complained about the Iowa puppy provider, welcomed the complaint and said it was long overdue. She said pet stores that take in such animals are also to blame "when they state their puppies are 'rescues,' when they clearly know the true source." Chicago passed an ordinance in 2015 banning shops from selling the commercially bred pets. At the time of its passage, pet shop owners criticized the law and said that typical rescue groups could never provide the kind of high-end, purebred and designer mix puppies customers wanted. The measure was intended to prevent Chicago businesses from sourcing dogs from so-called puppy mills, large-scale breeding facilities often criticized for deplorable conditions and mistreatment of the mother dogs. In the court filing, Miller accused J.A.K. 'S Puppies of flouting Chicago's ordinance, as well as a similar one in California. By misrepresenting a dog's origins, critics say the businesses hinder the Chicago ordinance's goal to reduce the number of shelter dogs euthanized in the city each year. The practice also misleads customers, some of whom may have only wanted a rescue puppy, the attorney general said. "No matter where they live, consumers should not be misled about the source of the pets they buy," Miller said Monday. "Puppy laundering obscures the identity of breeders who may have animal welfare violations or other problems." Iowa officials also are seeking to shut down Rescue Pets Iowa Corp., a shelter begun by people connected with J.A.K. 'S Puppies. The rescue was started in December 2018, after the attorney general's office issued a second request for records from J.A.K. 'S Puppies. The signature of Noethe, who is the president of Hobo K-9 and co-president of J.A.K. 'S Puppies, appears on veterinary inspection records connected with Rescue Pets Iowa, according to the complaint. Because of Noethe's connection to the rescue, Miller contends it is "a brand-new sham" charity and has asked the court to shutter it as well. "JAK's Puppies has yet to comply with the Attorney General's October 24, 2018 civil investigative demand requesting more information and documentation from it -- while Defendant Noethe apparently continued and continues her puppy laundering activities and associated with the latest sham entity known as Rescue Pets Iowa," the complaint reads. The attorney general's lawsuit should resonate across the country as more communities pass bans prohibiting pet stores from selling puppies from large commercial breeders, said John Goodwin, senior director of the Humane Society's Stop Puppy Mills campaign. Suburban Downers Grove, for example, passed an ordinance earlier this month that allows shops to sell only rescue animals. "From a national perspective, this sends a strong message to the puppy mill industry that they're not going to get away with bogus rescues," Goodwin said. The Tribune shared its findings last year with Chicago's Department of Business Affairs and Consumer Protection, which said it does not have the power to investigate whether out-of-state businesses are legitimate rescue operations. After the Tribune's 2018 report, Southwest Side Ald. Raymond Lopez, 15th, proposed changing the city law so that it allowed only dogs from a government facility or an organization "that has an agreement or other affiliation with Chicago Animal Care and Control" to be sold at local shops. The proposal, however, failed to gain momentum and the issue faded. On Monday, Lopez said he is working with animal advocates, city and state officials on tweaking the ordinance to close the loophole and others that may arise. He has met with owners from affected pet stores as well. He said only three stores remain open for business out of several that sold puppies before the ordinance. "I flat-out told them at some point their industry was coming to an end in the city of Chicago," Lopez said. "They know they are the last of their breed -- pun intended." Lopez applauded the Iowa attorney general's complaint. "The spirit of this action gets at the heart of what we've been talking about," he said. "People are manipulating rescues laws in order to make a profit." I am all for clean puppies! Who wants a dirty puppy anyways? Question: Where do rescue dogs come from? You don't get your dog fixed and it pops puppies and you take them to the shelter. You are a hero, while someone with a license and tries to produce a good product gets demonized. That's the U.S. today. I'm glad the Iowa Attorney General is handling this case. Iowa has one of the strongest state law enforcement agency in the country. But PLEASE, reporters, stop using the likes of John Goodman and the Humane Society of the United States for info or insight. HSUS doesn't run a single pet shelter anywhere in the world and doesn't fund a single one. Goodwin has a long arrest record and a conviction for violent direct action (illegal raids and property destruction). HSUS is all about sexual harassment, fundraising fraud, and pretending to shelter dogs. Haven't you heard? A great resource is caps-web.org. It specializes in puppy mills and investigations like this. And it's run by a woman! I'm thrilled to hear it!. Most breeders are in it to make a quick buck, They don't care about the animals or the quality of the puppy they're breeding. The animals live in horrific conditions and because these people don't selectively breed, the pups are born with all kinds of congenital health issues. When there are so many dogs and cats already in this world that are waiting for a forever home in shelters, unless you're going to be showing your animal and competing, there's no reason not to adopt one of these homeless animals instead of paying hundreds (and sometimes thousands) of dollars for a pure bred. So go down to the nearest shelter/humane society and adopt. You won't be sorry. These puppy mills are torture chambers. These animal receive virtually no exercise, irresponsible breeding, an no love. A responsible breeder only breeds if they can improve the breed. Anything else is irresponsible. There are no good breeder, ALL are bad. People should not be PURCHASING dogs, people should not be profiting . This idea that there is responsible breeders?? All breeders are bad. People that have to have a designer dog are bad. Time to round up all breeders, stop breeding and rescue the trembling desperate dogs that are being murdered.